In danger of getting lost amongst all of the other ‘seemed like a good idea to buy at the time’ offerings at airports and the like, this one definitely falls into the ‘must read’ category. 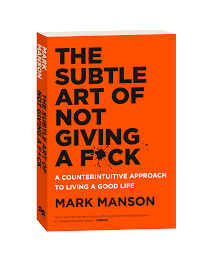 True to it’s title there is plenty of pretty direct and no punches pulled language in there but Manson has a style and approach that will resonate with most people. His own story – mostly revealed towards the end of the book – gives him plenty of credibility to be advising us on how to lead a better life and focus on what’s really important. And what’s not to give a f*ck about. I love the ACTION – INSPIRATION – MOTIVATION reframe and it’s something that absolutely works in practice. Enjoy.